The Lexington Legends are inviting non-profit organizations to participate in their Community Organization of the Night program during the 2015 season. The Community Organization program, sponsored for 2015 by Dean Dorton, offers non-profits a variety of opportunities to publicize their work at Whitaker Bank Ballpark and on Legends radio broadcasts during each of the Legends’ 70 home games. Hundreds of organizations throughout central and eastern Kentucky have participated. On their night at the ballpark, organizations may set up a display on the concourse, where they can greet fans and distribute information. Before the game, a representative of each Community Organization of the Night is interviewed on the public address system. The representative also is a guest on the radio broadcast for a half-inning during the game. Each organization receives four complimentary tickets to their game. Solicitation is not permitted, but there is a fund-raising element in the program. To maximize exposure and to boost fund-raising, organizations that reserve their night for a Thursday, Friday or Saturday game will purchase a minimum of 60 Legends fundraiser tickets at four dollars each. Fundraiser tickets may then be sold by the organization for up to the regular face value of 10 dollars, allowing the organization to raise up to six dollars per ticket sold. Game dates will be reserved on a first-come, first-served basis. For more information, call (859) 422-7855 or send e-mail to sbosso@lexingtonlegends.com. The Legends, class A affiliate of the Kansas City Royals, will open the 2015 season at Whitaker Bank Ballpark Thursday, April 16 at 7:05 p.m. against the West Virginia Power, an affiliate of the Pittsburgh Pirates. More information is available at lexingtonlegends.com. 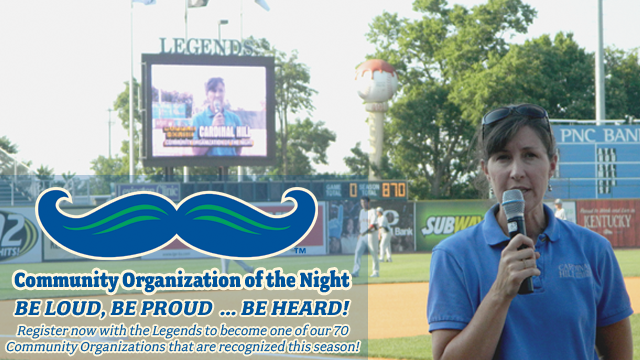 Non-profits invited to participate in the Community Organization of the Night program with the Legends!